5727 A small, table top sized, sloping stile cabinet, the open display section with a back panel inlaid with mother of pearl on the black lacquer ground with two open flowers on leafy stems, the spandrels and apron to the front inlaid with stylised sprigs of flowers. The stiles which slope inwards towards the top on both front and side elevations are similarly inlaid, as are the horizontal rails above and below the two doors. The single panel doors, with no central stile, and with no supporting transverse stretchers to the reverse, are inlaid with flowering plants again with stylised flowers to the cushion moulded frames. The hinges and lock plates of gilded brass have re-entrant corners and engraved decoration to the ground and are retained by split pins. The simply shaped apron again repeats the stylised flower design of the spandrels and cushion moulded stiles and door frames. This technique of using large pieces of mother of pearl inlaid into a lacquer ground is found on a number of pieces of extant furniture often with strange abstracted rocks flanked by stylised flowers. 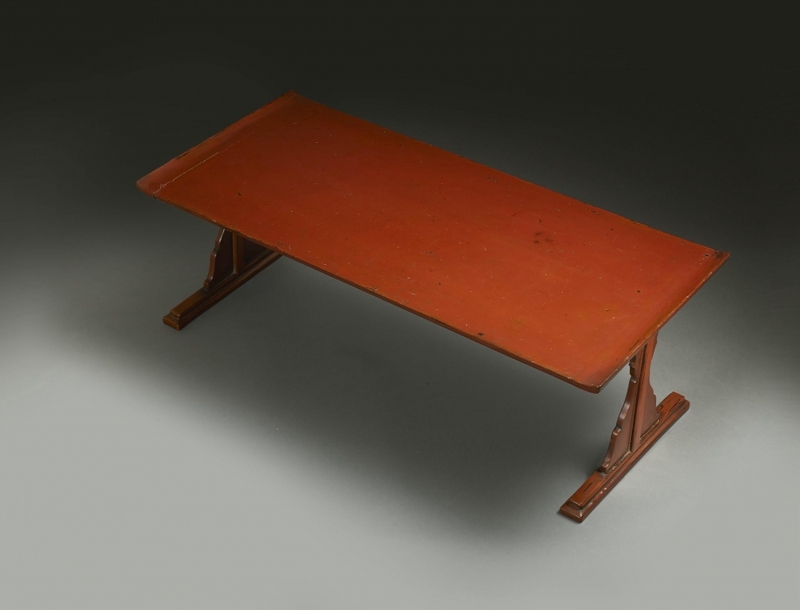 A bed, simply ascribed a Ming date, in the collection of the National Palace Museum, Beijing (‘Furniture of the Ming and Qing Dynasties (I) The Complete Collection of Treasures of the Palace Museum,’ 2002, no.3, pp. 10 – 13) has very similar flower sprays. A full scale pair of cabinets of this design in huanghuali, now in the Honolulu Academy of Arts, are illustrated by R.H.Ellsworth in, ‘Chinese Furniture, Hardwood Examples of the Ming and Early Ch’ing Periods,’ pl.136. 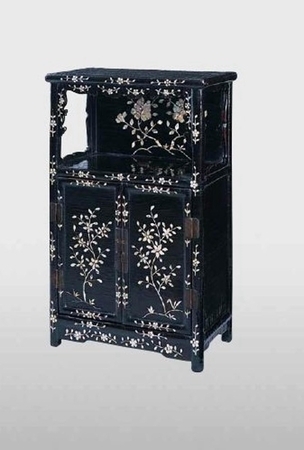 Another pair of huanghuali cabinets of similar design are in the collection of the Linden Museum, Stuttgart, Germany.